A 66-year-old woman was referred to our service because of a presyncope on effort and dyspnoea of exercise. Blood pressure was 130/85 mmHg, heart rate 78/min, with a left parasternal systolic murmur grade 4/6 and no clinical signs of pulmonary or systemic venous congestion. ECG showed sinus rhythm and left ventricular (LV) hypertrophy with strain. Echocardiography showed LV hypertrophy (interventricular septum 18 mm, posterior wall 15 mm in diastole); reduced LV cavity (diastolic LV diameter 36 mm, systolic LV diameter 18 mm), with good ejection fraction. Anatomic M mode showed anterior systolic motion of both mitral valves (Panel A- white arrows = early systole; red arrows = late systole). 3D echo confirmed the anterior displacement of both valve leafl ets (Panel B – white and red arrows) and crossover of mitral valves (Panel C – red arrow). The mitral leaflets appear elongated (Panel C-red arrow), oversized for the left ventricular size and together with the asymmetrical hypertrophy of the septum (Panel C-green arrow) provide the anatomical substrate for the development of intraventricular pressure gradient. Continuous Doppler examination with the sample near the septum found a dagger-shaped pattern, the flow velocity peaking in late systole (Panel D-arrow) This pattern indicates dynamic obstruction. Mitral regurgitation is related to morphological changes (Panel C: leaflets elongation -red arrow, papillary muscles hypertrophy P, septal hypertrophy – green arrow) and geometrical changes (translocation of mitral apparatus). The mitral regurgitation jet due to the geometrical changes of the mitral apparatus is directed posteriorly because the anterior leaflet has a larger contact area with the septum than the posterior one (Panel E – arrow). The coronarography showed no coronary artery stenosis but three gracile septal arteries unsuitable for embolization, simultaneously suggesting the possible involvement of small coronary arteries, an nomaly linked with hypertrophic cardiomyopathy (Panel Farrows). What makes this case remarkable is the possibility to visualize the movement of both mitral valve leaflets towards the hypertrophied septum. Also, the crossing of the elongated valve leaflets acts as a supplementary mechanism in the mitral regurgitation pathogeny. 1. Lancelloti P, Cosyns B. The EACVI Echo Handbook. Oxford University Press 2016. pp. 358-369. 2. Lang MR, Goldstein AS, Kronzon I, Khandheria B.K., Mor-Avi V. Cap. 71. Echocardiographic Features of Hypertrophic Cardiomyopathy: Mechanism of Systolic Anterior Motion. ASE Comprehensive Echocardiography. Elsevier-Saunders, 2016. 3. Karatasakis C, Athanassopoulos G.D. Cardiomyopathies in: Galiuto (ed). The EAE Textbook of Echocardiography. Oxford University Press 2011. pp. 304-310. Figure 1. Panel A- Anatomic M mode showing anterior systolic motion of both mitral valves, beginning in early systole (white arrow = early systole; red arrow = late systole). Panel B – 3D echo showing the anterior displacement of both valve leaflets (white and red arrows). Panel C –3D echo cross sections through the mitral apparatus showing elongated mitral leaflets and crossover of mitral valves (red arrow), asymmetrical hypertrophy of the septum (green arrow), papillary muscles hypertrophy (P). Panel D – Continuous Doppler examination with the sample near the septum found a dagger-shaped pattern, the flow velocity peaking in late systole (peak flow velocity = 3.96 m/s, peak gradient = 62.86 mmHg) (arrow). 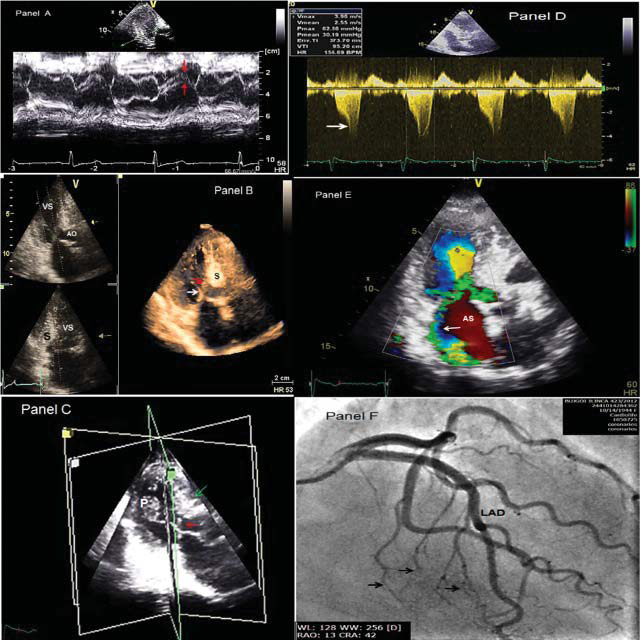 Panel E – Color Doppler flow showing the mitral regurgitation jet directed posteriorly (arrow). Panel F- the coronarography showing no coronary artery stenosis and three gracile septal arteries (arrows).